And the Overall Winner Is&hellip; It&#39;s a tie! 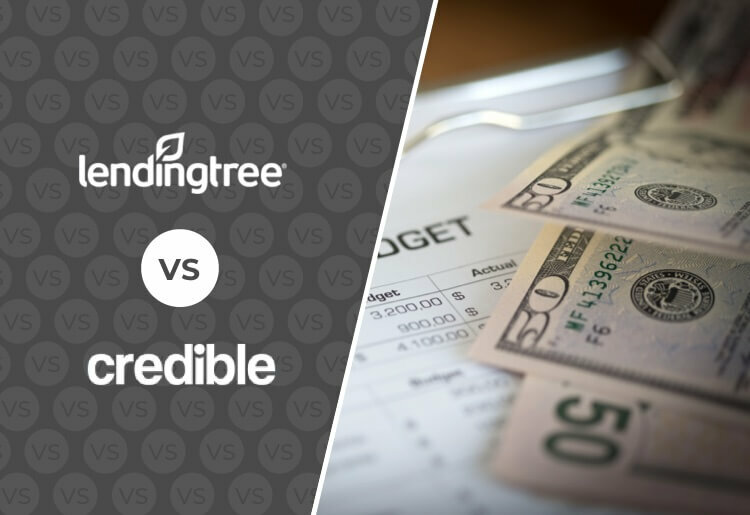 LendingTree vs Credible: Which Offers the Best Loan for You? With so many personal loan options available, it can be a tricky thing finding the best one for you. And if you attempt to apply to several simultaneously, it quickly becomes a giant mess of rates, terms, and amounts that you’d need to hire an accountant to get organized (not to mention what it does to your credit)! That’s where lending marketplaces come into the picture. A lending marketplace is a beautiful thing that allows you to apply to several lenders simultaneously. It’s faster because you fill out only one application form, and it’s easier to manage because all of the offers are arranged and organized within a single system. Two of the best options in this field are LendingTree and Credible. Both are lending marketplaces, which is great for comparison shopping for loans, but which is the lender network that’s right for you? Here’s an easy to compare review of the 2 services to help you decide for yourself and get the loan you need. LendingTree has been around since 1996, so it’s had decades to build its reputation, and quite a reputation it has. Having handed out over $6 billion to date, LendingTree is one of the most widely used and trusted lending marketplaces out there. It works with bad credit holders, has flexible repayment terms, and is an invaluable tool for comparing loan offers. Credible offers the same great convenience of a lending marketplace and has some of the biggest names backing it. Additionally, you’ll pay no origination, processing, or closing fees to this company. You can get up to 6 responses in minutes using Credible, though you’d better have a good credit score if you want to work with it. Both of these companies have a ton to offer someone looking to take out a personal loan quickly and efficiently. The big question is, how do you decide between them? Here is a thorough comparison of the most important factors to look at when deciding on a lender marketplace, so you can see where each one really shines. LendingTree is the obvious winner for the loan requirements section of our comparison. While Credible has a great product, it's somewhat of a VIP club. That's because, in order to work with Credible, you're required to have a credit score of 680 or higher. Credible has some big-name lenders partnering up with it, including Avant, Best Egg, LendingClub, Marcus, Prosper, and LightStream. Each member has its own requirements, but they all want a higher credit rating pool of borrowers. Conversely, because of its vast network of lenders, LendingTree is able to work with a huge variety of people, even those who have pretty lousy credit. With hundreds of partners to choose from, LendingTree will almost always be able to find you a lender that's willing to work with your situation. This is a difficult one to judge since both LendingTree and Credible work with such a huge range of lenders. Credible might have pulled ahead because it charges no origination fee. The reason we gave the win to LendingTree is because of its sheer numbers. With such a tremendous network of lenders, you have a lot more variety and, in this situation, that’s a great thing. It means more lenders competing for your loan. Competition drives down prices in any market, and it’s no different in the lending marketplace. More competition means that the rates you'll get offered will be more competitive, i.e., lower than they would be elsewhere. In fact, LendingTree loans are at least .5% less than you’ll get from other institutions like the big banks. Once again, LendingTree pulls ahead of Credible because of the numbers game it plays, but also for the terms themselves. Credible offers borrowers the flexibility to repay their loans anywhere from 2 years (24 months) up to 7 years (84 months). That’s amazing, but LendingTree does this one better by allowing you to pay back your loan over the course of 15 years! That’s 180 monthly payments, so you can arrange your finances to make the payments each month with ease. Signing up for a loan with Credible is really fast and easy. It takes less than a minute to fill out the basic questions being asked, such as your current employment status, level of education, and gross annual income. The fact that it takes under a minute to fill out the form that will then be sent to multiple lenders is a big plus for Credible, but LendingTree offers this same perk (albeit LendingTree's application process does take a minute or two more, for a grand total of 3 minutes instead of 1). What puts Credible over the top for this section of our review is that it offers pre-approval. You can find out right away whether or not you will be approved of for a loan and what type of terms you can get from various lenders. Getting this information on the spot is a lifesaver when you are anxious to get your loan (which most people are). LendingTree and Credible also both earn more points for allowing co-signers within your applications. If your credit score isn't good enough to be approved for a personal loan, you can apply for a loan with someone else as your co-signer. This opens up more opportunities for approval, a big plus for everyone. The customer support staff at LendingTree is available over the phone at 800-813-4620 on Monday-Thursday from 8am-9pm ET, Friday from 8am-8pm ET, and Saturday from 10am-7pm ET. And LendingTree even has TDD/TTY relay service numbers for every state. Alternatively, you can complete the contact form online to get an email response to your questions. Credible customer service can be reached via email or on the phone from Monday thru Thursday 6am-6pm PT, Friday from 6am-4pm PT, and Saturday/Sunday from 7am-4pm PT. The best part of Credible’s customer service though is that it offers live chat as well. This is an essential feature that most lenders haven’t come around to yet, but it puts Credible ahead of the competition by a lot. And the Overall Winner Is… It's a tie! Bottom line, Credible and LendingTree are both wonderful choices if you're looking for a lending marketplace. You'll get fast online service, access to multiple lenders, and flexible rates thanks to the competitive edge. If you have great credit and are confident in your credit history, Credible can be a good choice for you. It is also a very good place to look if you enjoy chatting with a service rep to answer your questions. LendingTree has competitive rates and terms, offering up to 15 years of repayment and some of the lowest APRs anywhere. It features a vast network of top lenders and works borrowers of all credit scores, making a solid all-round choice. With such great rates, terms, and customer service it's really difficult to pick an overall winner so in this battle of the top lending marketplaces it's an even tie.